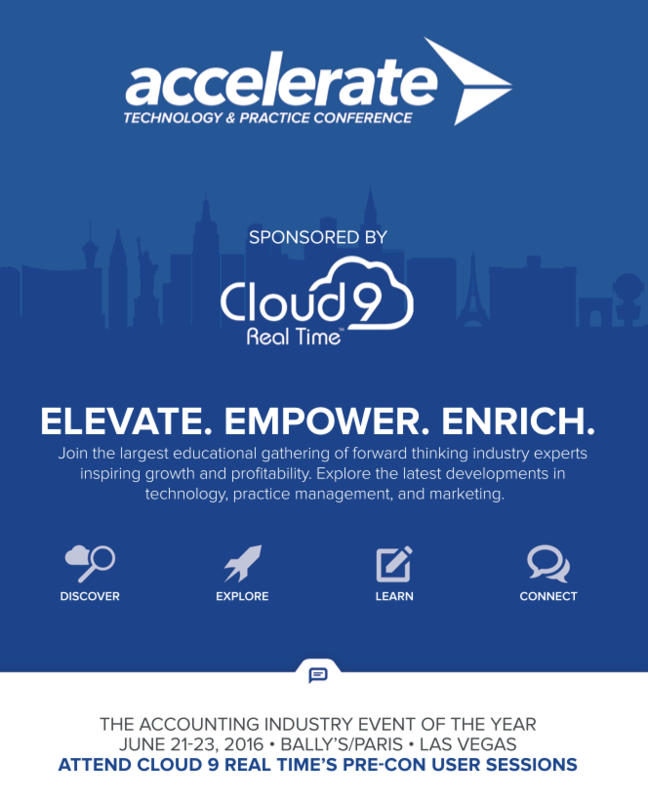 Jun 21-23, in Las Vegas, Nevada – Cloud9 and partners are excited to announce the 2016 Accelerate Conference. The Accelerate Conference provides an incredible opportunity, and is designed to help firms engage with new technology, marketing concepts and best practices. We’re bringing together thought leaders who will providing keynote presentations as well as roundtable and networking events. Those who attend the conference have an opportunity to connect with other colleagues and discover how firms are being successful. 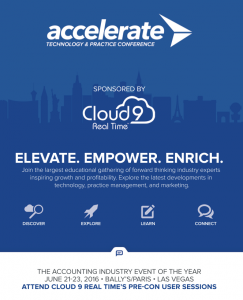 The Accelerate Conference will center around the best practices for utilizing Cloud Technologies and how top firms are leveraging its versatility to maximize their technology investments. Cloud technology is here to stay. Your clients expect a seamless experience, so it is important to become the value expert as your clients move to the cloud. Technologies change daily, as an Advisor, your challenge is to help clients utilize the latest technology in a way that is simple, scalable, and profitable. During our time together, we’ll simplify the cloud and show you how to take your next steps toward becoming a trusted advisor using cloud technologies. This session details ten simple ways trusted advisors leverage the cloud to increase efficiency and improve collaboration. You should attend if you are a current user wanting to increase your knowledge or a potential user interested in understanding how Cloud9’s technology positions you to grow your firm. Cloud technology provides businesses with a range of benefits including reduced IT costs, greater employee work flexibility, enhanced security, and business continuity in the event of a disaster. These benefits are just a few of the reasons many companies, both large and small, are moving to the cloud. As with any technology, how you implement your cloud solution has a lot to do with the benefits available to you and your clients. This session is designed to help you maximize your investment, whether you are an existing cloud user, or are simply considering investing in the cloud. During our time together, we’ll review powerful tips and tricks for improving efficiency and effectiveness for staff and client users alike. Our businesses are responsible for the protection of large amounts of private and personal information. Almost daily, news reports share stories of security incidents which could have been avoided had the proper security protocols been used. Security breaches betray client trust and garner a great deal of public attention. No business can afford to ignore their risks and exposure to data loss, breach, and theft. Whether you are an existing cloud user looking to improve your security or are just considering the cloud, this session will help by highlighting the pros and cons of different security solutions. We will provide a best practices checklist, and a list of free security resources. The face of the cloud and IT is changing rapidly. Today’s top practices use technology to reshape the way they meet the needs of their small business clients. Firms who want to position themselves for long-term success will place technology at the forefront of their practice. Already, the cloud is transitioning into the next phase, and the expectations for your firm are higher than ever. As a trusted advisor, your clients will turn to you – make sure you’re ready. In this session, you will learn the best practices for utilizing cloud technology, discover how top firms are leveraging the cloud to become trusted business advisors, and see how to maximize your technology investment by gaining helpful tools for managing systems and data. Managing the tension between the professional and personal is a challenge every leader confronts. Whether it’s death by meeting, the never ending pursuit of zero in-box, or the demanding client we just can’t afford to fire, the daily demand for our time, energy, and attention often leaves us feeling exhausted and empty. We don’t have to settle for exhausted and empty. Each of us can have a clear vision of a brighter future, a vision audacious enough to intimidate us but authentic enough to invigorate us. 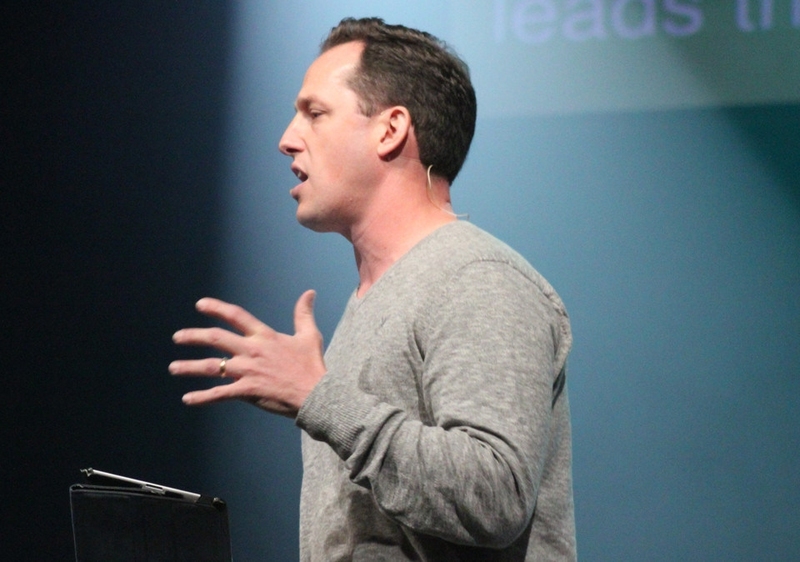 During his keynote, Josh Clark combines his experience as a marketplace leader, public speaker, and Advanced Certified Life Planner to deliver powerful insights and the practical tools needed to find a better rhythm and build a bigger life. BIO: Josh is the Senior Vice President of Cloud9 Real Time. A recent “40 Under 40” award winner, Clark oversees the strategic direction and operations of the company. His visionary leadership and relational style are revolutionizing the Cloud9 experience for staff and clients alike. A family man, living in Southern California, with his wife and five children, Josh possesses a depth of experience helping organizations increase their clarity, impact, and health. As a frequent public speaker, he inspires high-impact leaders to find a better rhythm and build a bigger life. Learn how a focus on technology can streamline your infrastructure and help your business stay ahead of the curve.